Valentine’s Day is about two weeks away. I know this night is always so special for Pat and I because we really make it a point to really unplug and just enjoy a night out together. Last year, Pat had surprised me and made reservations for a romantic dinner at the Proximity Hotel in Greensboro. The food was so delicious, the staff was super friendly and overall it was just completely romantic. The entire space was divided in different sections with white linen curtains, dozens of candles and vases of flowers at each table. I just remember feeling so pretty in my dress and heels and it was just an absolutely wonderful night! I always feel more relaxed the day of a holiday or celebration when I already know a head of time what I will be wearing. There is no shame in having a game plan! Start thinking about what you’ll be wearing that night so that when Tuesday, February 14th rolls around, you’ll be able to come home from work, change clothes and head on out. Or if you’ll celebrate on the Saturday before or after, you can sleep in and relax all day then simply change and head out! Either way works! 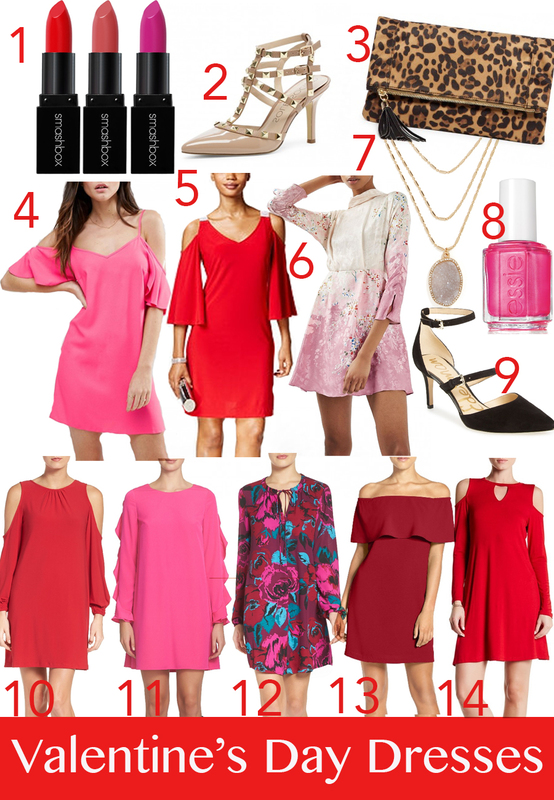 I’ve rounded up some of my favorite dresses for this year’s Valentine’s Day! You’ll see that ruffle details and cold shoulders are still a huge trend and you simply can’t go wrong with a bold floral printed dress either! Cheers to planning ahead & to love! I’m off somewhere super warm and sunny today, follow along my instagram (@BrittanyAnnCourtney) & snapchat (@britcourt).